We're spending a lot of time at Alpha Software working on making it easier to create mobile business apps that support sometimes- or frequently-disconnected operation. As part of that work, I've learned a lot about how this issue is an impediment to widespread mobile app deployment in business and also about many of the areas that must be addressed in order to do it well. I've just posted an essay that covers a lot of what I've learned. You can read "Dealing with Disconnected Operation in a Mobile Business Application: Issues and Techniques for Supporting Offline Usage" in the Writings section of my web site. Two days ago, on Wednesday, I watched the Google I/O Keynote live stream. Early on in the two and a half hour mega-presentation they introduced their new "visual language" for UI design: Material Design. It has "materials" inspired by paper with shadows, bold colorful graphics, and "meaningful" motion/animation. "Last year at I/O we announced Polymer, which is a powerful new UI library for the web. So, between the L preview and Polymer, you can bring the same, rich, fluid Material Design to every screen." Wow, I thought, Google not only designed a mobile UI for their Java-driven devices, they went to the trouble of also then building it in HTML5 for web apps (mobile and desktop). How is Polymer related to material design? Polymer is the embodiment of material design for the web. The Polymer team works closely with the design teams behind material design. In fact, Polymer played a key role in material design's development: it was used to quickly prototype and iterate on design concepts. The material design components are still a work in progress, but will mature over the coming months. So, the HTML5 version wasn't created after the native versions. It was the prototyping environment before the native code. This is a great model to follow: Prototype, iterate, and even first ship, in HTML5. Once you know what you need, if necessary, take the time to do native code. This doesn't just apply to the old desktop (as it has for years). It also applies to today's polished, fluid mobile world. As a developer who is closely connected to a system that produces HTML5, and that aids in rapid prototyping, I was delighted. Here are some of the leading-edge mobile developers, and they found that HTML5 has the power to do what they want, and do it quickly enough for the demands of the iterative design and testing that is so important in the mobile world. After hearing so many people claiming that "they hear" that HTML5 doesn't have the power for serious mobile applications, it was vindication to hear of people who actually build things choosing to go the HTML5 route, even when cost clearly wasn't the object, and succeeding. I guess it's time for a new moble-related tag: #HTML5first. For various reasons I decided that I needed an app tuned to reading reference material. I've released a new app that demonstrates addressing this need to the Apple App Store and the Google Play Store: AlphaRef King James Version of the Bible. This is the text of the Bible presented in a new reading environment that I created along with my daughter Adina, a UX and graphics designer. It is implemented using Alpha Anywhere and delivered as an HTML5 app in a PhoneGap wrapper. To read the whole story, and to see a video of the app in action, read "AlphaRef Reader: Tablet-first design of an app for reading reference material" in the Writings section of my web site. 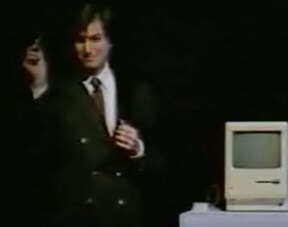 The January 30, 1984, video of the introduction of the Macintosh to the public at a Boston Computer Society General Meeting is now available online. Harry McCracken, an editor at large at TIME for personal technology, posted an exclusive look at the video early this morning, right after excerpts where shown at the Mac 30th event in California (an "official" event marking the 30th anniversary of the original Mac announcement at the same place where it occurred). The Computer History Museum will be posting material on its web site tomorrow, and will update the video when additional processing of it finishes. See "Exclusive: Watch Steve Jobs’ First Demonstration of the Mac for the Public, Unseen Since 1984" on TIME.com. Harry explains how there were other videos of prior deliveries of Steve Job's talk introducing the Mac, but that this one is special for several reasons, some of which I have touched upon in my blog post Friday about it, such as the Q&A with a general tech audience. He also explains a bit about how the release of the video came about. Let me fill in a bit more. These were not fully "lost" videos. I have had my copy of the January 1984 VHS tape for years and let others know I had it, showing excepts sometimes when I gave talks. Given the use of Apple material, and the special nature of the video, I did not feel it was time to release it yet to the public as I was slowly doing with other videos I have (not BCS ones). I was in contact with the videographer, Glenn Koenig, who shot most of the BCS meetings on Software Arts' behalf over the years. He let me know that he had masters of many of them, though he hadn't cataloged them (and didn't search out the Jobs one until Harry asked, which yielded better versions of parts of the presentation). I let him know of the material that I had made sure made it to the Computer History Museum. I encouraged him to continue to maintain his tapes in good condition, which is what he has been doing all these years. When Harry, a BCS member going back to the VisiCalc days, contacted BCS founder Jonathan Rotenberg in the fall of 2012 to ask about video from BCS meetings, Jonathan got him in contact with Glenn. Glenn, Jonathan, and I brainstormed about ways to finally make the restoration and release happen. I contacted Ray Ozzie, who I knew was interested in historic videos and had worked with us at Software Arts in the early 1980's. He, like Harry, suggested the Computer History Museum as a means for funding instead of something like Kickstarter. I have been a long-time supporter of the Museum, and have been inducted as one of their "fellows" for my work on VisiCalc, and knew this was the right way to go. Eventually, Jonathan, Glenn, and I started working with people at the Museum, cataloging which material we had between us, and worked up a budget and a plan for fundraising. Glenn pointed out the upcoming 30th anniversary of the Mac as a good "news hook" and that a hoped-for article by TIME could help publicize the entire set (thank-you, Harry, for coming through with a great one!). We met periodically on the phone (we all had other jobs to keep us very busy) and eventually crafted a "request" letter and a list of potential donors. Glenn produced a short trailer of excerpts from a few of the tapes using some refurbished equipment to show those people. In September of last year we had the material ready for fundraising and I hand-signed (and in some cases added a little note to) a few dozen letters and mailed them out. Within a little while some money trickled in. Then, Brad Feld, a friend from the early Trellix days now living in Colorado, contacted me for more information. Within a few days he and his wife Amy became the major funders, ensuring that the project was well off the ground. He also helped us by reaching out to some of the people I had approached, too. We have since raised enough to do this project well, and hopefully even do additional tapes that are surfacing, though the Museum could always use additional funds for such things. The people producing the video for the Mac 30th event, most importantly Gabreal Franklin, helped Glenn work out details and ensured that there would be quality video for their event, both from the January 1984 video and some other. For many reasons, including the difficulty in getting the slides shown the way we need them, the current version of the Mac Introduction is just a "rough cut". There is more editing that will occur. In any case, Glenn did many late nights to make this happen on time. Now that everything is set up, we will be processing other videos, too, and release them in batches. I'll write more about them when they are available. To me, some are of them are of the same historic value as this one, if not more. The Mac Introduction video has served its purpose well. It has drawn attention to the Boston Computer Society and the other videos, and to the Museum. It has helped a new generation see what happened in the early days of the PC revolution, and an older generation remember their past, and helped chronicle the thinking of the time for posterity. It has also helped fill in the record of the life of a giant of our industry, capturing an interaction with the users of his works like no other. Today is 30 years since the Apple Macintosh was announced. That event occurred at a shareholders meeting in California. The following Monday, Steve Jobs and a crew of people from Apple traveled to Boston, Massachusetts, to redo that event for the public. It was at the Boston Computer Society General Meeting on January 30, 1984, at the John Hancock Hall in Boston. In addition to Steve's speech and demonstration, he also brought many of the developers of the Mac software and hardware with him. After his presentation, they all sat on stage and answered questions from the audience and did further demos. For the over 1,000 people who attended, it was an amazing event. At the shareholders meeting there was the worry of how it would be received and if the demos would work. At the BCS meeting there was much less pressure and Steve was relaxed and confident and engaged the audience. The attendees were knowledgeable and savvy. There is something else about the Boston event: My old company, Software Arts, at my suggestion as I recall, was paying to have video tapes made of many of the BCS General Meetings. (I was a board member of the BCS at various points). For this event, Apple provided additional cameras and made sure the lighting was good (it was not good in California, apparently). What happened last year is something wonderful: It turns out that many of the original BCS meeting tapes still exist. Some were donated to the Computer History Museum with my help. Many of the master tapes were still with the videographer, Glenn Koenig, including 3/4" tapes that are higher quality than the VHS copies. Together with Glenn and Jonathan Rotenberg (the founder and initial head of the BCS), we finally started a project with the Computer History Museum to restore the tapes and make the videos available to the public. This involves careful work on refurbished old equipment and careful editing remembering the events themselves to get the best possible video and sound. It will also include transcripts and other related museum-type treatments. We have raised money to pay for this (there are over 20 meetings to process) and have started digitizing and editing the tapes. The Mac Introduction will be the first, but there are others of great interest with the leaders of many leading personal computing companies, from Microsoft to Radio Shack to Digital Research to Lotus and IBM. A thank you to Brad Feld, who remembers the impact the BCS had on his interest in both technology and entrepreneurship from his days at MIT, and all of the others who came through with the money we needed! The Mac video will be released soon (I'll post here when it's available) and others will follow over time. For those of you who have only seen the young Steve Jobs portrayed by actors, seeing him and his team as they actually were should be a real treat. I get chills down my spine watching it. It is such a joy to realize that a decision we made over 30 years ago at my old company, when the personal computing industry was a young oddity, will bring those days to life for a new generation and for generations to come and that they will care and appreciate it. I recorded a 20-minute podcast interview with Jonathan yesterday to get the back story on how he, a 20-year-old at the time, got Steve Jobs to debut in Boston. You can listen to the MP3 recording of our Skype conversation, "Jonathan Rotenberg about the 1984 BCS Mac event 2014-01-22" on my podcast channel. In those days, the top companies in the industry would come to the BCS and other user groups to demonstrate their new innovations, sometimes as their first public showing. (The BCS was the most influential and probably biggest such group.) Local and national TV didn't show up to document the events (though the Wall Street Journal and other press often did). However, "personal" video taping helped preserve some of it. I know that other user groups did taping (I have some tape of me at a least one of those venues) and I hope that other material has been preserved and will be made available to the public and to historians through the Museum and other means.